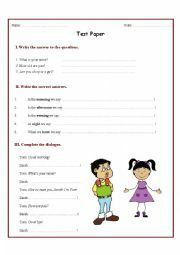 This worksheet checks understanding of some verb tenses, such as: present simple, present continuous,present perfect simple and past simple. Students are supposed to distinguish between the usage of present simple and present continuous. They are also asked to answer some questions using the two tenses. 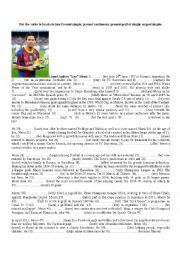 This is a test paper to check understanding of the second conditional. 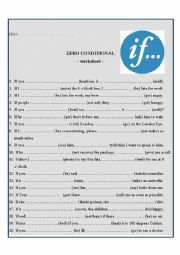 Students get to practice the first conditional by listening to a song and finding first conditional clauses and then, by completing first conditional clauses. 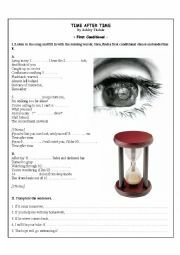 This is a test paper meant to check understanding of the past simple - regular and irregular verbs and also time adverbials. Students are supposed to give the correct form of the zero conditional. 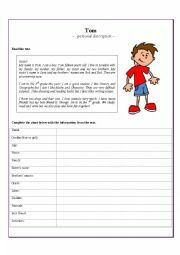 It�s a reading comprehension activity for beginners; they have to read the short text and then extract specific info from the text. 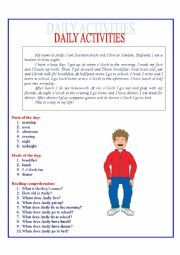 It�s a reading comprehension activity for young learners based on daily routines. 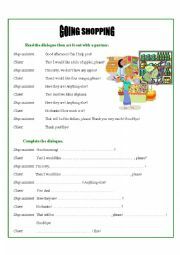 This activity focuses on shopping dialogues. 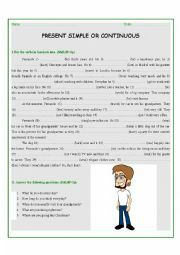 This is an easy test paper for beginners who are required to introduce themselves and to greet.